In my second interview with the backpacking buddies and friends I have made over the years, I am delighted to introduce Haya Harpaz. Haya is from Israel and after meeting her in Antarctica in 2010, my girlfriend and I visited her there in 2013 and attended her wedding! So naturally it’s a delight to have Haya in the series! Backpacking Buddies – Haya Harpaz from Israel – at her wedding in Afula, Israel. Haya, 29 years old, Works in a boring job. Married+a lovely dog. 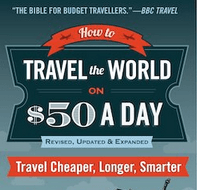 South America, Africa, USA, Canada, many places in Europe, Jordan, Australia, New Zealand – around 25 countries. Currently in Israel, but traveling to Iceland next month. After Iceland I may visit my brother in Norway. I’m dreaming about traveling to Morocco, China, Romania and many more. As a student, I worked in a Laundry place, doing laundry and folding clothes. Actually, I found the folding quite relaxing. Antarctica – no doubt about it. I met Jonny and his girlfriend Panny on the boat to Antarctica. 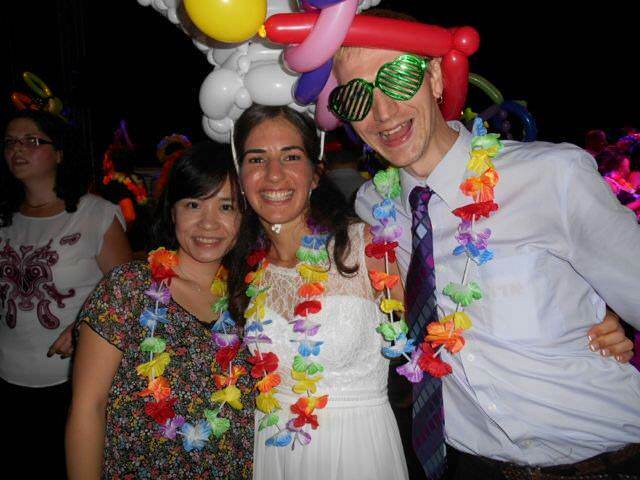 Last year, both of them attended my wedding in Israel! (Jonny’s note – Panny was not my girlfriend at the time we were in Antarctica but we got together soon afterwards). 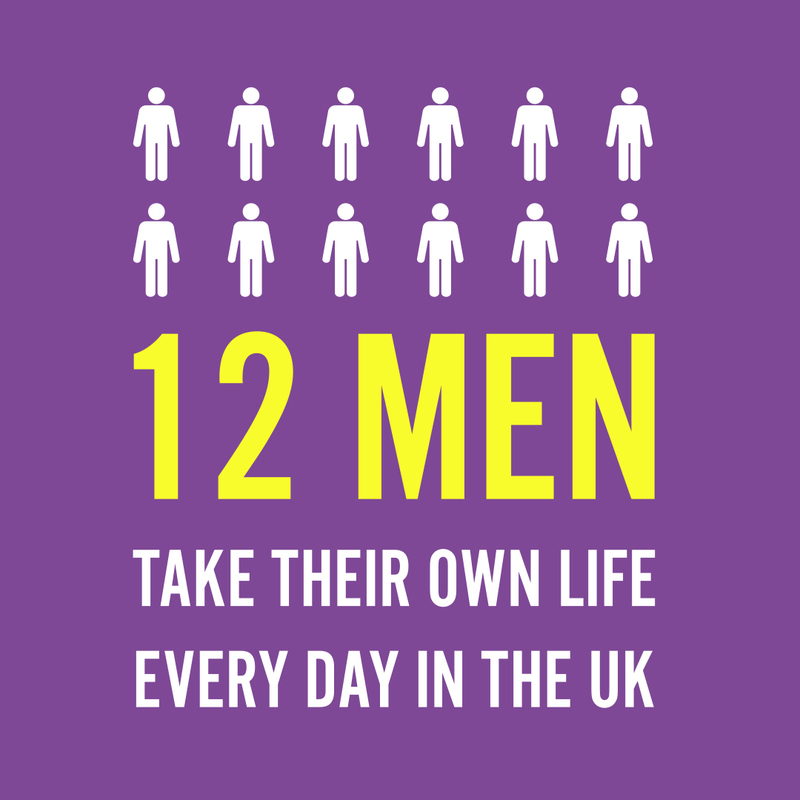 To have lots of lots of money and no obligations and to be able to travel around the world and visit remote places that only a few people have seen. a. Antarctica – The 11 days crouise is taking you to lovely places! b. Africa – Kilimanjaro in Tanzania. c. South America – Huaraz in Peru. d. Australia – the desert. e. Asia – The treck from Mestia tu Ushguli in Georgia. f. Europe – Moher cliffs, Ireland. g. North America – New York (I was there as a young girl and haven’t seen much of the nature). 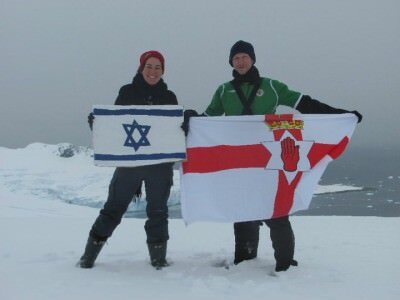 Backpacking Buddies – Israel and Northern Ireland flags flying at Cuverville, Antarctica. My first memories of Haya Harpaz came at the peak of Cuverville Island in Antarctica. While at the top everyone in our group was happy and cheerful and of course posing for photos. I saw Haya with her Israel flag and at the same time I was posing with my Northern Ireland flag so I went over and we got a photo together! That was my first time to meet Haya. 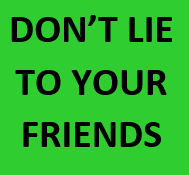 We became good buddies on board the ship and later shared a dorm room and went partying in Ushuaia, Argentina. Then 3 years later I attended Haya’s wedding in Israel and the photo of us in Antarctica together was even used on her wedding video on the big screen. I hope to bump into Haya again at some point on our journeys! 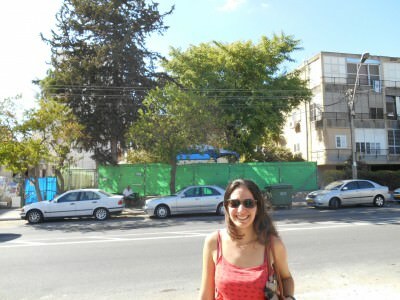 Backpacking Buddies: Haya Harpaz in Afula, Israel.